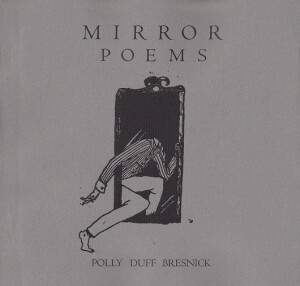 Polly Bresnick’s new book is here, Mirror Poems, from O’Clock Press. The book is beautiful and handmade and hefty (and has drawings from Bianca Stone, who is everywhere these days, good job), and the concept is hefty too and fun, and the poems themselves ain’t too bad, it bears saying. What the book is is first of all a translation from the Spanish of Patricia Serra Delmar’s Poemario Rouge, and those translations appear on the lefthand page, but then Polly does a feint and provides an antonymic translation on the righthand page. So she’s translated every poem twice, and it’s fun to cross reference her ideas of antonyms. Like, Delmar has a poem called “Red and Green” but Polly changes it to its opposite, “Green or Red,” and then there’s one called “Brazil” that she changes to “Texas.” I laugh audibly sometimes as I scan the pages back and forth. Polly’s figured out a fun way to read.